sOMEThING - Premium plastic performance without the premium price! When 4x World Yo-Yo Champion Hiroyuki Suzuki makes a new yo-yo, it's time to pay attention. 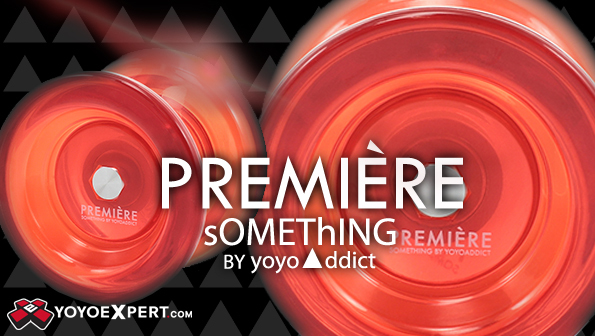 And the latest yo-yo to come out of the sOMEThING workshop is this injection molded masterpiece - The Premiere! We love to see high end yo-yo manufacturers take the time to produce a more budget friendly plastic model, so when we heard that a premium Japanese brand like sOMEThING was making one, we got excited! And the Premiere does not disappoint! When you first see the Premiere you notice an immediate similarity to another sOMEThING throw, the Addiction, but even though the Premiere may look similar, it has the feel of sOMEThING completely new! They ditched the metal weight rings to reduce costs, beefed up the rims to compensate for weight, and gave the cup super clean lines and a simple engraving for those added style points. The final result is a fast fun floaty throw that has stability for days, perfect for any style! Fitted with a Center Trac Bearing and one of the most wallet friendly price tags we have seen, the Premiere is hard to beat! Whether you're a beginner getting into unresponsive play or an expert looking for a new everyday carry, the Premiere is sOMEThING everyone can get excited about!